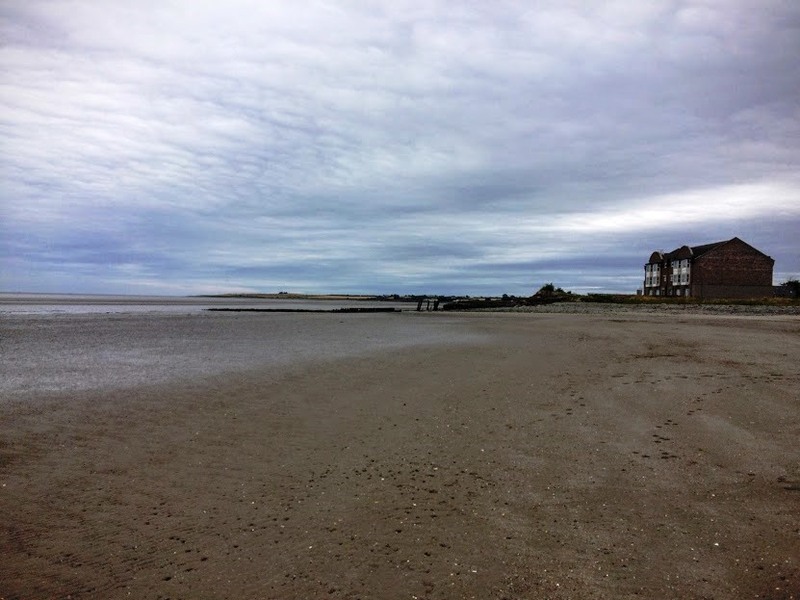 Monday [1 August 2016] was a bank holiday in the Republic of Ireland, and three of us decided to drive north of Dublin, and visit Annagassan in Co Louth, which featured as No 16 in that list of great beaches. 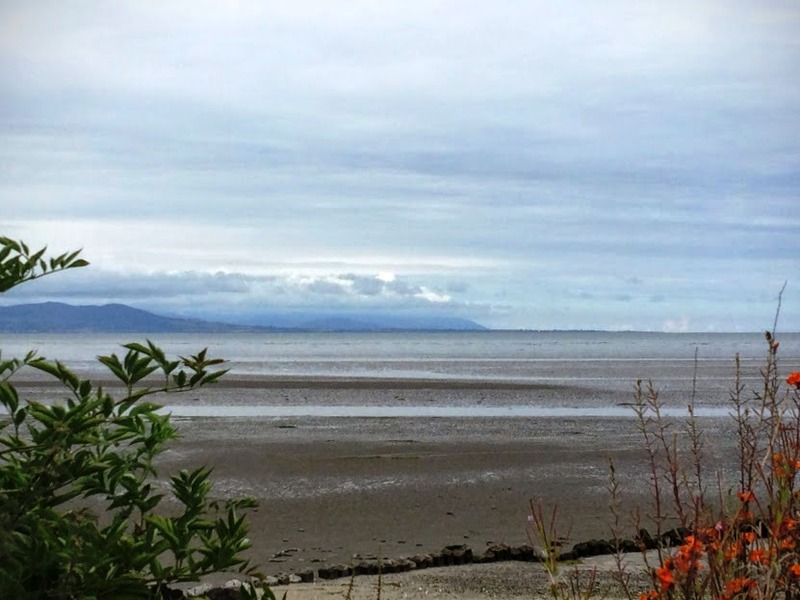 Annagassan is a small village on the southern shores of Dundalk Bay, at the point where the River Glyde and the River Dee flow into the Irish Sea, within sight of the Cooley Mountains and the Mourne Mountains. We turned off before the Castlebellingham exit on the M1, and drove through fields of summer gold and green through Dunleer to the delightfully sleepy and picturesque village of Annagassan. We parked at the harbour with its colourful fishing boats and trawlers taking a bank holiday rest. The tide was so far out that the harbour seemed silted up. From the south side of the harbour walls, we walked along the long and expansive stretch of sand, with only the three of us to take in the views of the bay and across to the Cooley Peninsula and the Mourne Mountains. We stopped for lunch at the award-winning Glyde Inn, sitting at the outside terrace and enjoying the views of the sea and sand despite an unseasonable chill in the air. The Vikings first settled in Annagassan in 841 AD and built Linn Duachaill, a substantial longphort or ship enclosure that is believed to have been the first Viking settlement in Ireland. Both Carlingford and Greenore in north Co Louth have Norse names, and there is a tradition that Drogheda was founded on the site of a Viking settlement. But Linn Duachaill, near Annagassan, was identified in 2010 in an archaeological dig funded by the Louth Leader Partnership, and is now regarded as one of the best preserved Viking settlements in Europe. Viking activity in Co Louth is documented in the Irish annals from the 820s and the foundation of a permanent settlement on the coast at Linn Duachaill is recorded in the year 841, the same year as the longphort in Dublin was established. From this settlement, the Vikings prepared their forces and plundered the surrounding areas. But their activities were also responsible directly for the foundation of new, inland monasteries, such as Louth Abbey, founded by monks who fled inland to avoid Viking raids on coastal areas. For half a century, the longphort of Linn Duachaill was an important base for launching raids into the Irish interior and on Britain. However, in 891, the local Irish people expelled the Vikings from Linn Duachaill. After two decades, the Vikings returned and Linn Duachaill served as a base until around 927. At an early stage, it may have rivalled Dublin as a Viking base on the east coast of Ireland. However, its location was not entirely ideal for developing a town. Soon it was being eclipsed by Dublin, and when their fleet finally left, the Vikings abandoned Linn Duachaill. Since the mid-18th century, antiquarians, archaeologists and historians have speculated about the precise location of the longphort of Linn Duachaill. In 2004, Eamonn P Kelly of the National Museum, Micheál McKeown, a local historian, and Dr Mark Clinton of An Taiusce, a field archaeologist, formed a research group with the aim of identifying the site. Local placenames provide evidence that suggested that Linn Duachaill was located in the townland of Linns, just north of Annagassan. The townland is bounded on one side by the sea and on the other by the river Glyde and its confluence with the river Dee, effectively forming a steep-sided peninsula. The high point of the peninsula is at the southern end above the confluence of the rivers. Some scholars believed that the D-shaped earthwork known as Lis na Rann may have been the Viking fortification referred to in the annals as Linn Duachaill. However, the earthwork is only 80 metres x 35 metres, and seemed too small for a site of such importance when it is compared with other longphort sites, such as Dunrally, Co Laois, Knoxspark, Co Sligo, and Woodstown, Co Waterford. Lis na Rann is at too high an elevation on the steep river bank to have served as a fortress that could protect a Viking fleet. But the research group thought Lis na Rann could have been part of a larger Viking fortification, functioning as a strong point or citadel. They thought the longphort was located within the tidal limit of the River Glyde, which extends as far as a weir on the boundary of the townland of Linns. It was also considered essential that the elevation of the riverbank should be low enough to allow ships to be taken ashore or launched. These topographical factors drew their attention to an area of low elevation to the south of the weir. Further research showed that archaeological finds in the past in the low-lying area, including two items of fine metalwork of Irish type, were probably from ecclesiastical objects dating from the eighth or ninth century. Similar items of Irish metalwork found in Viking graves in Norway and at Kilmainham and Islandbridge in Dublin, and also at Woodstown, Co Waterford and Knoxspark, Co Sligo. These items are evidence of raiding and trading by Vikings in Ireland. In the 19th century, dredging of the River Glyde and the River Dee uncovered more objects with Viking links, including a Viking axe and an iron slave chain that may be evidence of Viking slave raids upriver from Linn Duachaill. All this evidence pointed archaeologists to the low-lying area on the riverbank south of the weir, and Micheál McKeown organised field-walk was organised and directed by when the field was ploughed in 2008. All the indications were that this was a key area of the longphort of Linn Duachaill. The evidence indicates that Linn Duchaill was a significant Viking settlement with ship-building, carpentry, smelting and an artificial island used to defend the place against the local people. Now local people and visitors alike dress up in Viking costumes for the Viking Festival each year, when they re-enact Viking battles and sing Viking songs. The Viking Festival normally takes place in August, although the festival takes place a little later this year, with 10 September. From the Glyde Inn we walked back through Annagassan to the bridge, and then down to the peaceful harbour with those brightly-coloured fishing boats that ply the waters of Dundalk Bay. Over a century ago, the harbour at Annagassan played its role in one of the great romantic weddings of the Edwardian decade. In 1905, Augusta Mary Monica Bellingham, daughter of Sir Alan Bellingham of Bellingham Castle, married John Crichton-Stuart, 4th Marquis of Bute, and then one of the wealthiest men in these isles. No expense was spared in treating the bride and guests to a lavish celebration. The Princess Maud, a steamer, was chartered to take their guests and the Isle of Bute pipe band across the Irish Sea to Bellingham Castle for the wedding, and the wedding party arrived at Anngassan Harbour. As the society event of the year, the wedding attracted the world’s media attention, from California to New Zealand. Surviving footage from the wedding celebrations still exists and is believed to be the one of the earliest wedding films in the world. Bellingham Castle is seen clearly in the footage, as well as scenes at Kilsaran Church and the village of Annagassan. The wedding party and their guests left as they had arrived, by steamer from Annagassan. To find out more about the Bellingham family and Bellingham Castle, we decided to move on to the neighbouring village of Castlebellingham. But that’s a story worth telling tomorrow [Wednesday] and the day after[Thursday].